Is pharmacological, H2S-induced 'suspended animation' feasible in the ICU? By definition, 'suspended animation' is a hypometabolic state characterized by the “the slowing of life processes by external means without termination” . Various mammalian species are capable of nearly completely shutting down their vital functions in order to survive otherwise lethal environmental conditions, such as prolonged impairment of O2 supply and/or extreme temperatures. First described and studied in patients as “hibernation artificielle” induced by the so-called “cocktail lytique” during the Indochina war in the early 1950 s, for obvious reasons the concept of inducing such a hypometabolic condition has attracted special interest in intensive care and emergency medicine. Originally, organ-protection, in particular for the central nervous system (CNS), was demonstrated when suspended animation was induced by rapidly cooling experimental animals to core body temperatures of about 10-15 °C using ice-cold infusions and/or cardiopulmonary bypass (CPB). Given the potential undesired adverse effects of hypothermia per se, e. g., metabolic acidosis, coagulopathy, prolonged inflammation, and impaired host defense, any pharmacological measure allowing for a therapeutic on-demand induction of suspended animation would be of particular interest. Moreover, more recently, it was suggested that the reduced visceral organ function present in critically ill patients and/or after overwhelming hyperinflammation could be referred to as an adaptive mechanism to maintain ATP-homeostasis due to reduced energy expenditure rather than to irreversible organ failure . A landmark paper by Blackstone et al. produced much excitement among researchers in the field of shock and critical illness: These authors demonstrated that mice inhaling hydrogen sulfide (H2S) reversibly decreased their energy expenditure, which was associated with a fall in core temperature . In the meantime, numerous pre-clinical studies have been published on the possible organ-protective effects of H2S, the available data being equivocal depending on the model used and the type of shock investigated. In this context in particular, the impact of H2S effects on energy metabolism remains a matter of debate. Therefore, the present chapter reviews the available data on H2S-induced on-demand hypometabolism, and its relation (directly as well as via a possible consecutive drop in body temperature) to organ-protective properties of H2S. In their above-mentioned murine study, Blackstone et al. demonstrated, in awake, spontaneously breathing animals, that exposure to incremental, sub-toxic gaseous H2S concentrations (20-80 ppm) dose-dependently decreased energy expenditure within a few minutes as assessed by calorimetric measurement of whole-body O2 uptake and CO2 production. This fall in metabolic activity was associated with bradypnea and consecutive hypothermia, with core temperature falling to levels close to ambient values . After washout of H2S, all these metabolic and cardiopulmonary effects were completely reversible, and animals showed no apparent sequelae. Subsequently, Volpato et al. reported that the reduced metabolic activity went along with bradycardia and, consequently, reduced cardiac output, whereas blood pressure and stroke volume remained unaffected . Maintaining normothermia by external warming attenuated the metabolic depressor effect, but did not completely blunt the cardiovascular response . Various other rodent models confirmed these observations: Inhaling gaseous H2S [5–12] and infusing the soluble sulfide salts, NaSH or Na2S , , , also induced a reversible reduction in energy expenditure with a subsequent fall in core temperature. Under stress conditions resulting from injurious mechanical ventilation , , ischemia/reperfusion , , , endotoxin challenge , or bacterial sepsis , this effect coincided with attenuation of lung , [12–14], liver , kidney  and heart  injury. Most importantly, survival was improved after otherwise lethal stress states, e. g., hemorrhagic shock  and exposure to hypoxic hypoxia (fraction of inspired O2 [FiO2] 5 %) . In addition to anti-oxidant, anti-inflammatory, and anti-apoptotic properties, H2S was associated with better maintenance of mitochondrial integrity and function , , : Treatment with either gaseous H2S treatment or injection of Na2S prevented mitochondrial swelling, loss of crypts , , and, at least under hypothermic conditions, outer mitochondrial membrane rupture as documented by the lack of responsiveness of the mitochondrial respiratory chain to stimulation with exogenous cytochrome c .
It should be noted that most of the above-mentioned murine data originate from experiments in awake, spontaneously breathing animals. Consequently, the role of anesthesia for a putative H2S-induced suspended animation remains unclear. Currently, scarce literature is available comparing the effects of anesthesia and H2S per se. In spontaneously breathing mice, Li et al. demonstrated that H2S (80 and 250 ppm) produced the same metabolic depression as 0.3 and 0.9 % of isoflurane, respectively, however, without any anesthesia-related muscle atonia. Strikingly, when combining these two interventions, H2S even antagonized the isoflurane-induced metabolic depression . Finally, in mechanically ventilated mice under continuous intravenous (i.v.) anesthesia, the metabolic depressor effect of H2S was completely blunted when normothermia was maintained . Any metabolic depressant property of H2S seems to be dependent on the animal size: In rats the H2S-induced decrease in O2 uptake was several-fold lower than in mice . In larger species (swine, sheep), various authors failed to confirm any H2S-related reduction in metabolic activity at all, regardless of whether inhalation of gaseous H2S or injection of sulfide salts were studied [19–22]. Moreover, in sheep, Derwall et al. demonstrated that during administration of gaseous H2S via an extra-corporeal, veno-arterial membrane oxygenator to avoid any airway mucosa damage related to the gas inhalation , , whole body O2 uptake, CO2 production, and cardiac output remained within the physiological range. At the highest doses administered (300 ppm), H2S did not affect calorimetric energy expenditure either, but caused pulmonary vasoconstriction associated with arterial hypotension and metabolic acidosis . Finally, in human volunteers, inhalation of 10 ppm H2S during exercise decreased O2 uptake, and this effect was referred to a toxic reduction in maximal aerobic capacity rather than to a regulatory effect on mitochondrial respiration, as evidenced by a tendency for muscle lactate to increase and citrate synthase activity to decrease . Consequently, it was questioned whether any therapeutic potential of the H2S-induced “suspended animation”-like hypometabolism observed in mice and rats could be transferred to the clinical setting , . On the other hand, when external measures to prevent hypothermia were withheld, Na2S-related organ-protection after kidney ischemia/reperfusion-injury  or hemorrhage and resuscitation  coincided with a progressive decrease in core temperature (Figure 1). Moreover, in the latter experiments, immediate post-mortem liver tissue mitochondrial activity showed a tendency towards both reduced oxidative phosphorylation and maximal O2 uptake in the uncoupled state, and, in particular, a significantly decreased “leak respiration”, i. e., the respiratory activity necessary to compensate for the proton leakage, slipping, and cation-exchange along the inner mitochondrial membrane (Figure 2). In other words, H2S supplementation under these conditions provided protective reduction rather than toxic inhibition of cellular respiration. Time course of body core temperature in swine undergoing (a) 90 minutes intra-aortic balloon occlusion-induced kidney ischemia/reperfusion-injury (data are adapted from : Dark blue squares, vehicle n = 10; blue circles, Na 2 S n = 9; all data are mean ± SD, § designates p < 0.05 between groups); (b) hemorrhage and resuscitation (data are adapted from : black squares, vehicle n = 14; dark blue squares, Na 2 S started two hours before hemorrhage, n = 10; light blue squares, Na 2 S started simultaneously with hemorrhage, n = 11; blue triangles, Na 2 S started immediately after hemorrhage, n = 10; all data are mean ± SD, § designates p < 0.05 'simultaneous' treatment vs. vehicle). 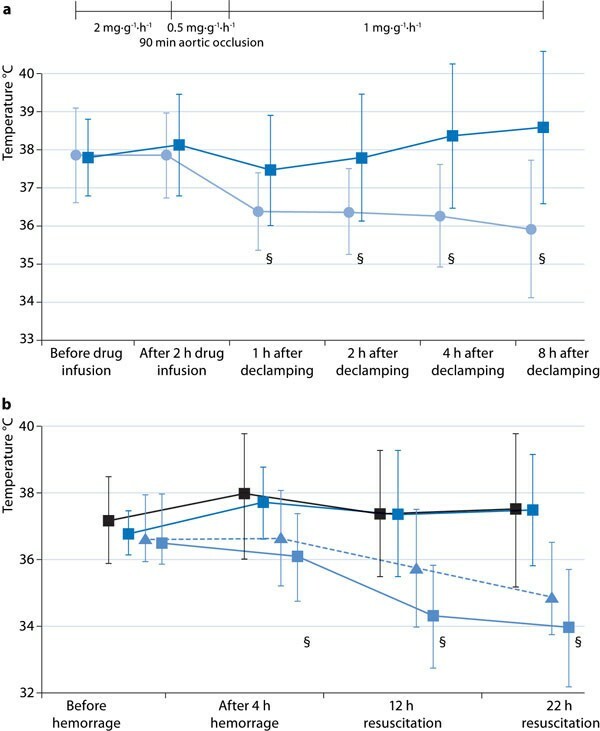 Note that in both experimental series at least four hours of drug infusion were necessary to achieve a significant decrease in body temperature. 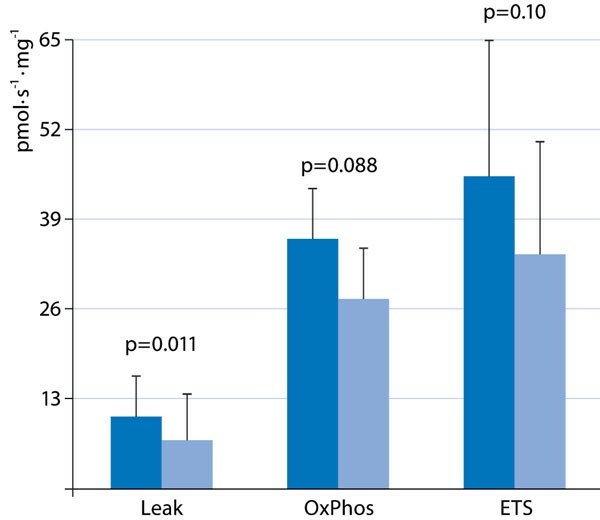 Leak respiration (Le ak), i. e., O 2 consumption necessary to compensate for the proton leakage, slipping, and cationexchange along the inner mitochondrial membrane; maximal oxidative phosphorylation (OxPhos); and maximal O 2 uptake in the uncoupled state (ETS) in immediate post-mortem liver biopsies of animals undergoing hemorrhage and resuscitation treated with vehicle and Na 2 S infusion started simultaneously with the initiation of blood withdrawal. For protocol details, see . All data are mean ± SD of O2 uptake in pmol/s/mg tissue; dark blue columns: vehicle, n = 9; light blue columns: Na2S, n = 10. How can these diverging findings be reconciled? Under stress conditions, e. g., in response to hypoxia or circulatory shock, small rodents can reduce their energy expenditure as a result of decreased 'non-shivering thermogenesis' , due to modulation of the uncoupling protein-1, mostly in the brown adipose tissue . In these species, non-shivering thermogenesis represents a large proportion of total O2 uptake, which can be rapidly decreased without affecting ATP formation . This response is independent of any pharmacological intervention, and represents a unique protective adaptation present in numerous mammals  and even in humans, e. g., in neonates and during cold acclimatization . However, due to the high area/volume ratio and, consequently, the higher heat dissipation, it is inversely related to body size , i. e., to the ratio of O2 consumption and body weight. Two phenomena support this latter notion: i) No matter the species, newborns present with more pronounced hypoxia-induced hypo-metabolism than do adults ; ii) when the ratio of O2 consumption and body weight per se is low (e. g., in adults of larger species), normoxic O2 uptake (e. g., during exercise ) may be associated with hypoxia-induced hypometabolism. Hence, if possible at all, achieving a suspended animation-like status in larger animals and humans will be more difficult and require much more time because of the small surface area/mass ratio: In fact, in anesthetized and mechanically ventilated swine, after four hours of Na2S infusion whole body O2 uptake and CO2 production started to decrease, subsequently resulting in a moderate decrease in core temperature at ten hours of drug infusion  (Fig. 1). No matter the current debate on the feasibility of pharmacological induction of whole body suspended animation in larger animals, inducing hypometabolism to hibernate isolated organs and, thereby, prolong their tolerance against tissue ischemia or hypoxia remains an attractive option, in particular for organ transplantation. Numerous studies in rodents have demonstrated that H2S administration improved kidney, liver heart, and lung function and attenuated histological damage after orthotopic organ transplant. This beneficial effect of H2S administration (NaSH 0.5 mmol/l over 10 minutes before and immediately after initiation of reperfusion) was confirmed in isolated porcine kidneys ex vivo undergoing normothermic reperfusion with autologous blood after 25 minutes of warm ischemia and subsequently 18 hours of storage at 4 °C . Equivocal data are available whether hypothermia, caused by a possible H2S-related fall in energy expenditure and/or due to external cooling measures, assumes importance for organ protection achieved during H2S administration. Inhaling H2S prior to myocardial ischemia at concentrations that had no metabolic depressant effect (10 ppm) attenuated organ damage, but to a lesser degree than concentrations that reduced energy expenditure (100 ppm) , suggesting that hypo-metabolism may indeed enhance the organ-protective properties of H2S. Of note, in that study as well as in others demonstrating H2S-related organ production coinciding with reduced metabolic activity, hypothermia was prevented , , , , in order to elucidate the impact of a simultaneous drop in core temperature. Moreover, organ protection and improved survival were also shown to be in part , , , ,  or even completely , , ,  independent of any H2S-induced metabolic depression at all. Finally, data obtained in large animal (swine or sheep) models of shock resulting from ischemia/reperfusion , [38–42], hemorrhage and resuscitation , or burn injury  also suggested that the beneficial effects of infusing Na2S were at least in part independent of metabolic depression and/or a fall in core temperature. Hence, any moderate hypothermia observed simultaneously with H2S-induced organ-protection may also be due to attenuation of systemic inflammation rather than to reduced energy expenditure per se. In other words, such findings raise a 'chicken and egg' problem, which can be attributed to the so-called Q10 effect, i. e., the two to three fold reduction in all chemical reactions and thus metabolism associated with a 10 °C-reduction of body temperature : As an example, during otherwise lethal porcine hemorrhage, therapeutic hypothermia was associated with reduced concentrations of pro-inflammatory cytokines . The potential of H2S acting as a metabolic depressant in larger species independent of any anti-inflammatory and antioxidant property still remains unsettled: In the abovementioned swine study showing an H2S-induced drop in O2 uptake and CO2 production as well as a consecutive moderate fall in core temperature, animals underwent a short period of aortic occlusion, which did not cause any increase in the blood levels of pro-inflammatory cytokines or markers of oxidative and nitrosative stress . Irrespective of the question as to whether or not there is cause-effect relationship between H2S-related organ protection and coinciding hypometabolism and/or hypothermia, hypothermia does assume importance for H2S-induced effects on substrate utilization and mitochondrial function. It is well-established that H2S toxicity is due to inhibition of mitochondrial respiration resulting from blockade of the complex IV of the respiratory chain, i. e., cytochrome c oxidase . When compared to normothermia, hypothermia (27 °C) increased the Na2S concentrations necessary to induce inhibition of mitochondrial respiratory activity (from < 1 μΜ to 2-4 μΜ), and nearly doubled the Na2S concentrations required for a 50 % reduction in mitochondrial respiratory activity , . Hypothermia may also influence the effect of H2S on substrate utilization and, thereby, may even improve the yield of the mitochondrial respiration: In anesthetized and ventilated mice, during normothermia, inhaling 100 ppm H2S did not affect endogenous glucose production (as calculated from the rate of appearance of 1,2,3,4,5,6-13C6-glucose during continuous i.v. isotope infusion), whole body CO2 production, or direct, aerobic glucose oxidation rate (as derived from VCO2 and the expiratory 13CO2/12CO2 ratio) (Fig. 3). However, under hypothermic (core temperature 27 °C) conditions, the rate of direct, aerobic glucose oxidation increased, suggesting a shift toward preferential carbohydrate utilization  (Fig. 3). Such a switch in fuel utilization is associated with an improved yield of oxidative phosphorylation: The ATP synthesis/O2 consumption ratio is higher for glycolysis than for β-oxidation, because nicotinamide adenine dinucleotide (NADH) as an electron donor provides three coupling sites rather than just two from FADH2 . 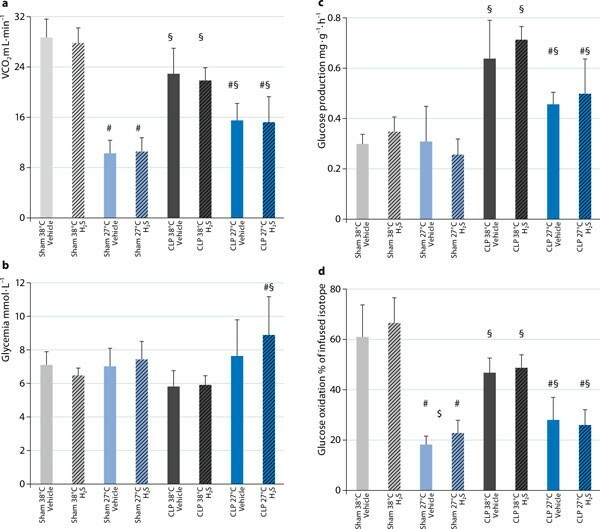 During cecal ligation and puncture-induced septic shock, the metabolic effects of inhaled H2S partially disappeared: Inhaled H2S affected neither the sepsis-induced metabolic acidosis  nor glucose utilization (Figure 3), nor the responsiveness to stimulation with exogenous cytochrome c oxidase. Nevertheless, H2S did normalize the sepsis-related increase in “leak respiration” - which was less pronounced during hypothermia - thus allowing for better maintenance of mitochondrial function (Figure 4). It is unclear whether the lack of effect of H2S on the mitochondrial respiratory chain was due to the septic challenge per se and/or to the ongoing treatment: During sepsis, all mice needed continuous i.v. norepinephrine to achieve target hemodynamics characterized by a normotensive and hyperdynamic circulation. In turn, norepinephrine incubation was associated with impairment of tissue mitochondrial respiration. 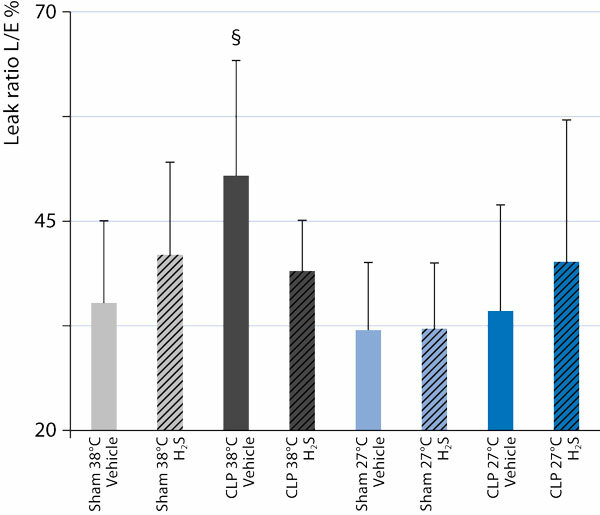 Whole body CO 2 production (VCO 2 ) (a), glycemia (b), endogenous glucose production (c), and direct, aerobic whole body glucose oxidation (d) in anesthetized and mechanically ventilated, normo-(38 °C; gray columns) and hypothermic (27 °C; blue columns) mice undergoing sham surgery ( light gray and light blue columns) or cecal ligation and puncture (CLP)-induced sepsis ( dark gray and dark blue columns) during inhalation of vehicle ( open columns ) and 100 ppm H 2 S ( hatched columns ). Data for sham-surgery are adapted from . All data are mean ± SD, n = 8-11 per group, # designates p < 0.05 vs. normothermia, § designates p < 0.05 CLP vs. sham, $ designates p < 0.05 H2S vs. vehicle. Leak state O 2 consumption, i. e., the respiratory activity necessary to compensate for the proton leakage, slipping, and cation-exchange along the inner mitochondrial membrane, as a fraction of the maximal O 2 consumption in the uncoupled state, obtained from liver tissue of anesthetized and mechanically ventilated, normo-(38 °C; gray columns ) and hypothermic (27 °C; blue columns ) mice undergoing sham surgery ( light gray and light blue columns ) or cecal ligation and puncture (CLP)-induced sepsis ( darkgray and dark blue columns ) during inhalation of vehicle ( open columns ) and 100 ppm H 2 S ( hatchedcolumns ). Data for sham-surgery are adapted from . All data are mean ± SD, $ designates p < 0.05 H2S vs. vehicle. No matter the importance of hypometabolism for the organ-protective properties of H2S administration per se, the questions of timing and - due to the potential toxic inhibition of mitochondrial respiration - dosing of H2S remain unsettled. Clearly, there are plenty of data available showing that inhalation of H2S gas and/or the injection of NaSH or Na2S can prevent organ damage when administered prior to or at least simultaneously with the initiation of shock. However, the very few studies comparing a pre- and post-treatment design in mice showed marked reduction  or even complete disappearance  of the protective potency. In swine undergoing long-term hemorrhage and resuscitation, the results were even more curious : Primed-continuous Na2S administration (initial bolus of 0.2 mg/kg, followed by 1 mg/kg/h over 12 hours of resuscitation) improved survival when compared to vehicle (survival: 71 %), regardless of whether the Na2S infusion was started two hours before (pre-treatment: survival 100 %) or simultaneously with (survival 91 %) the initiation of blood withdrawal, or at the start of re-transfusion of shed blood (post-treatment: survival 90 %) . However, a significant decrease in core temperature (Figure 1b) and organ protection were only present in the group of animals treated simultaneously with the initiation of hemorrhage. Apparently, both the cumulative H2S dose as well as the rate of its generation assume importance for the effects on metabolism and organ protection, in particular under low flow conditions and/or circulatory shock: In swine undergoing cardiac arrest, primed-continuous Na2S (0.3 mg/kg followed by 0.3 mg/kg/h over two hours) injected one minute after the start of cardiopulmonary resuscitation (CPR) reduced blood pressure and cardiac output during early resuscitation . Increasing the Na2S dose (1.0 mg/kg followed by 1.0 mg/kg/h) was associated with impaired neurological recovery. Even injection of comparable total amounts may have markedly different effects due to the different rate of H2S generation: In vitro slow H2S release from the H2S donor GYY4137 exerted anti-inflammatory and -apoptotic effects, whereas short-term, high peak free sulfide levels resulting from incubation with NaSH induced the opposite response . In vivo, this concept was confirmed in swine undergoing myocardial ischemia/ reperfusion injury: A primed-continuous Na2S infusion was superior to bolus injection . The concept of “buying time in suspended animation”  has been discussed in the literature for more than a century. Originally induced by rapid external body cooling, any pharmacological measure allowing for a therapeutic, on demand induction of 'suspended animation' is of particular interest because of the undesired side effects of hypothermia per se. Therefore, the landmark paper demonstrating that inhaling H2S could induce a reversible, suspended animation-like hypometabolism , produced much excitement among researchers in the field of shock and critical illness. Numerous pre-clinical studies are currently available on H2S-related organ protection, but the effects on energy metabolism remain a matter of debate. In this context, the well-established toxic blockade of cytochrome c oxidase by H2S may assume particular importance. Most studies so far suggest that the beneficial effects of H2S are at least in part independent of an H2S-induced metabolic depression and, in particular, any decrease in core temperature. However, other data suggest that H2S-related hypo-metabolism may enhance the organ-protective properties. The mechanism behind H2S-induced hypometa-bolism is still not fully understood, and, moreover, the feasibility of H2S-induced suspended animation in larger animals has been questioned. Clearly, if possible at all, achieving a suspended animation-like status in larger animals and humans will be more difficult and require much more time because of the small surface area/mass ratio. Again the available data are equivocal, suggesting that at least hibernating isolated organs remains an option. Even in larger species, data on the effects of H2S on mitochondrial function and morphology suggest that its supplementation during circulatory shock provides protective reduction rather than toxic inhibition of cellular respiration. Finally, according to the currently available literature, neither inhalation of gaseous H2S nor injection of the soluble sulfide salts, NaSH or Na2S, is likely to become part of clinical practice because of damage to the airway mucosa and possibly toxic peak sulfide concentrations, respectively, but slow H2S-releasing molecules may enable these limitations to be overcome. Hence, there is “nothing rotten about hydrogen sulfide's medical promise” , and H2S clearly remains a “hot molecule”  in the field of research for a possible pharmacological induction of suspended animation-like hypometabolism. Publication was funded thanks to support by the Deutsche Forschungsgemeinschaft (KFO 200, DFG RA 396/9-2), the Land Baden-Württemberg (Innovationsfond Medizin), and the Bundesministerium der Verteidigung (Vertragsforschungsvorhaben M/SABX/8A004). This article is published under license to BioMed Central Ltd. This article is one of ten reviews selected from the Annual Update in Intensive Care and Emergency Medicine 2014 and co-published as a series in Critical Care. Other articles in the series can be found online at http://ccforum.com/series/annualupdate2014. Further information about the Annual Update in Intensive Care and Emergency Medicine is available from http://www.springer.com/series/8901.